Did you know, for instance, that your intelligence is not fixed, but that you can build it up? Despite increased wealth and improved lifestyles, don't we sometimes feel burned out? With the weight of the world on our shoulders: Stress, information overload, chronic illnesses, obesity, violence, war, fragmentation, litigation, crime, disorientation etc.. How do we deal with these? Are we professionally equipped to manage? How can we somehow use what we do to contribute with solutions? Or indeed, can we even cope ourselves? We don't learn "life skills" at school. During our lives we pick up useful tips and little pieces here and there with experience. Normally we fumble through. Yet more often than not we are so busy with work, families and our lives that we don't take the time to look and evaluate those "pieces" and put them in a proper context. And so, even though we apply our own wisdom, they sometimes do not seem to work that well. This workshop looks at a some of these "life skills" in an integrated fashion. How can we, for instance, boost our brain power to find solutions to our life's challenges? What can we do to align our health to our desires? The workshop is an exploration of techniques and wisdom taken from the best in Western science and in Eastern philosophy. Come and experience the cosmic dance of life!
.) who feel there is something missing in what they do in their daily lives. They may not have put their finger on what is amiss, have not taken the time to work it out, or are simply not sure where to start looking. It is also for people who simply want to expand their horizons and experience something quite different. This is a very intimate workshop, but it does not infringe on your privacy. The workshop is a highly enriching experience, giving you practical techniques to take home and apply later. Hopefully you also find you some new friends with whom you can continue sharing deeper moments even after the workshop. The workshop is based on some of the latest findings in neurology and brain power (e.g. Renaissance project), in nutrition and agriculture, in preventative health care, in linguistic and associative programming, in communication theory, biology, evolution theory, information theory, sensory perception, analogy and creativity. This is blended with spiritual wisdom and techniques of Eastern philosophy, symbolism, rituals, chakras, sutras and mantras from Buddhism, Hinduism, Taoism, Shinto and Confucianism. However, this is a practical workshop applying recipes from these fields, this is not a course about science or philosophy. On the contrary you will be learning, living and using a cross selection of these techniques. Of course we cannot cover all these in depth in one day - they all warrant several days in their own right. At the end of the day, however, you will go home with a few procedures in each of the above. The purpose is for you to gain an overview of possibilities, acquire some practical skills from latest research and learn a little about Eastern holistic perspectives: the whole is more than the sum of the parts, the parts are all interrelated - it is necessary to embrace all parts at the same time, we are all one. This workshop is like a mosaic where the gems of the puzzle come together to form a new outlook, a spiritual alchemy, at the end of the day. In the workshop we apply accelerated learning and 'suggestopedia' techniques, so even though a great deal of ground is covered, you will remember most of it! At the end you also learn about accelerated learning itself, since this is also a useful skill which can be applied in many situations. Indeed, a memorable day. The workshop is highly interactive and participatory. You will be asked to move around the room, brainstorm, image stream with others, dance, relax, take notes, act, think, work with space and music. In fact most of the time you will be moving around! So come in comfortable clothes and trainers, ideal for moving around, and bring lots of bottled water (lunch is provided). Most of all you will learn a lot about yourself at a deeper level, and at the same time have a good deal of fun! So bring a sense of adventure too! The evolution of animals started in water (amoebae, fish), then moved to land (amphibians, reptiles, mammals). 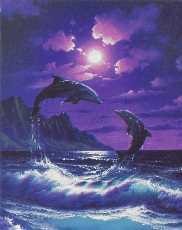 Are we moving back to water (whales, dolphins)? According to latest research, and contrary to common belief, we can increase intelligence and build up brain power, like muscle. We will practice some techniques. Image sensory networking through music! According to WHO diseases are increasing. While "healthcare" is focussed on curing, what we should be looking at is how to keep healthy in the first place. According to Eastern principles we are what we believe and choose to be. By working on ourselves holistically we can achieve goals and desires with passion. Holism from the Greek holos (whole) is defined as an approach viewing wholes as greater than the sum or their parts (OED). Creativity and problem-solving requires the generation of new ideas and solutions which are often found outside the problem. Holism allows one to expand our imagination beyond the mere obvious. And just like 'holistic medicine' looks at the person as a whole taking various factors into consideration, not just the physical body symptoms, so too creativity should not be the domain of the mind only, but is very much linked to our perceptions of the physical world and our well being. Holistic creativity is about relationships between parts. It allows us to bridge poles, link body and mind and generate solutions to our problems. Everyone should be creative. We are talking here of idea creativity rather than artistic creativity. Creativity is not the domain of a few select innovators, but al should be engaged and engulfed in it - for example it is fundamental to everything the Japanese do (Kaizen - continuous improvement). Everyone can benefit from learning holistic creativity and problem-solving. This workshop is based on some the best techniques found both in the West and in oriental philosophy. Come and learn to excel in creative problem-solving - something that will help you in all aspects of your life. This is a highly interactive workshop, with a tremendous amount of exchange among participants. At the end you will not only have recipes to take home with you to carry on using, but you will also have made some new friends on a different level than what we normally experience in daily life. You will not only learn a great deal, but you will also be completely re-energised, in a day of adventure, mystery and fun! Currently workshops held West of London, England - for dates, venue and fees see Dates & Venue.